Michael Crichton directed seven films; six were major feature releases and one, the first titled Pursuit, was a television movie. I was able to find five of the seven trailers on YouTube, and I also found a scene of Crichton's final film. Unfortunately I was unable to find anything from his first. 1989. Physical Evidence ; the trailer wasn't available, but this nifty little scene was. Michael Crichton was an immensely talented man. His creative work spanned five decades. His first novel, Odds On, was published as a paperback original in 1966 and his final novel—left partially completed at his death—is scheduled for release in 2010. He also wrote and directed films for both Hollywood and television, including Westworld, Coma, Twister and ER. In the late-1960s and early-1970s Mr Crichton wrote eight slim thrillers under the pseudonym John Lange. The novels were published between 1966 and 1972, and each was competent, exciting and different. Two of these early “John Lange” novels were recently republished by Hard Case Crime and can easily be found, but the other six are more difficult and can fetch princely sums on the secondary market. I recently read Binary for the second time and I was absolutely blown away. It is different from the two titles HCC republished, in that it is not a straight forward suspense adventure novel, but rather a kind of rare hybrid suspense high-tech whodunit. It harkens more to the fiction Crichton became famous for—The Andromeda Strain, et al—as it contains a flavor of science and technology; explained in simple and easily understood terminology without ever letting the pace slacken or the mystery suffer. John Graves is a long-time investigator for the Intelligence Division of the State Department. He began his career in the foreign branch of Intelligence, but he has since been transferred to the domestic side—a change he does not approve of, or much enjoy. He stays with the agency less out of loyalty and enjoyment than trajectory. He does it simply because that is what he does. On the night of August 22, 1972 seven armed men rob a U.S. Army train with a deadly chemical agent aboard; they make-off with ½-ton of the ZV agent. It is a deadly chemical that is without equal in its potency and practicality to cause death. The State Department has information that the chemical is going to be used in an attack on the Republican National Convention at San Diego. A wealthy Howard Hughes-type—John Wright—is the suspect and John Graves is the lead investigator. The two men—hero and villain—spar in an unconventional manner. It is more of a chess match than a hardboiled investigation as each man tries to outwit the other move by move. There are more than a few intentionally placed red herrings, and Graves must decipher the riddle, and outthink his opponent or more than one million people will die. Binary was the last novel Michael Crichton wrote as by John Lange and it is a perfect ending for the nom de plume. 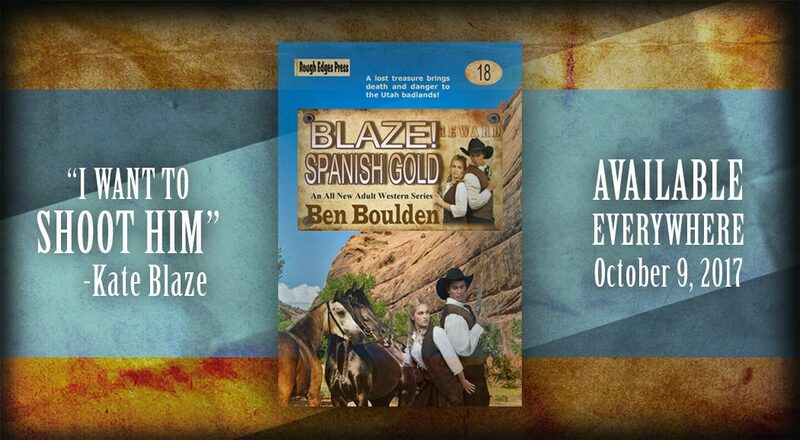 It is a quick and fast-paced novel. The action takes place over a 12-hour period and it snakes from meeting rooms to the warm August streets of San Diego. It is a strange mixture of a whodunit puzzle, and Crichton parcels out the clues as the novel moves along, with a hard-nosed American suspense novel. The prose is simple and effective—“In a corner of the bedroom draped over a chair was a sports coat. He found a ticket for the noon plane to Acapulco in the pocket. A first-class ticket, one-way.” It feels almost invisible and never once gets in the way of the story and action. The setting is easily shaped into a believable place—Crichton alternately praises and whips—mostly whips—California. It is a young and irresponsible place that is too hot and lacks any sort of class. The dialogue is well shaped and the characters are molded perfectly into the story—there is the villain’s beautiful but dumb girlfriend, and Graves is forced to deal with a micro-managing and very dull supervisor. His team is competent, but not so much that you would notice. The ending isn't a surprise, as far as the action is concerned, but the manner in which it plays out is very much a shock. In the end, it is the mystery, or the puzzle portion of the climax, that makes Binary work. And it works very, very well. A NOTE. 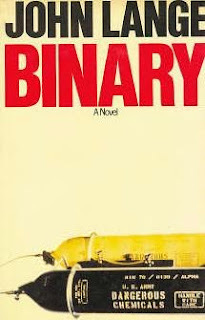 Binary was published in 1972 and it was made into a television movie that was directed by Michael Crichton titled Pursuit. The screenplay was written by Robert Dozier. It starred Ben Gazzara, and E.G. Marshall. It aired, according to IMDB, December 12, 1972. —Chester Drum is a Washington D.C. private detective, and on a late and warm August night as he walks past his office he notices a light inside. He makes a routine check with the elevator operator who tells him the cleaning staff should be done. Drum then takes the elevator to his floor and quietly approaches his office; inside he finds a cleaning woman with a very cold war tale. —The story is swift and, as expected from Marlowe, exciting. The plotline is sleek and straight and there really aren’t any surprises to a twenty-first century reader. That doesn’t mean it isn’t a good story, because it is a terrific story, but rather it means it is a story of its time. A small capsule filled with the popular fear and turmoil of the 1950s. I make this point not to weaken “Terrorists,” but rather to make the point that fiction, including popular fiction, is a mirror of the culture that creates it. Go into any used bookstore or library and take a novel from the shelf and you will find a nugget of truth about the time and place it was written; not the whole truth, but rather an image that represents the truth and atmosphere of the era—the fiction of the 1950s was saturated with communism and paranoia, just as the fiction of the 1980s was ripe with greed, drugs and Vietnam. “Terrorists” is a brilliant example of both entertainment and place. When it is read it grabs the reader by the ear and jerks him into a past that only exists in memory and archive; it is a capsule that helps the reader understand from where he came and, hopefully, where he can go or, at least, avoid returning. It also allows the reader to understand how little civilization has changed over the past fifty; the enemies have changed (maybe), but the fear is very much alive. There is a 1996 interview with Dean Koontz over at YouTube--I've loaded it below--from the old, much lamented, Tom Snyder show. It feels less like an interview and more like a conversation, which is what separates the hacks from true interviewers. It is humorous, fun and extremely entertaining. Dean talks about his move to Las Vegas, his book Santa's Twin, a cruise, and even, briefly, The Book of Counted Sorrows. A title that any Dean Koontz reader knows very well. The interview runs about twenty minutes and is very much worth a watch. You wouldn’t know it from reading my blog—except for one lone post—but I’m a huge Jack M. Bickham fan. I first discovered his work when I read his fourth Brad Smith novel—Breakfast at Wimbledon—back in the mid-1990s and I have been reading his work ever since. 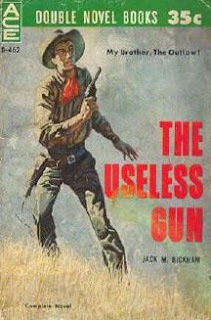 I recently read an ACE Double Western titled The Useless Gun. It was paired with The Long Fuse by John H. Latham, and published in 1960. It is the fourth (of five) Western novels Bickham wrote for ACE, and it’s really pretty good. Clayton Hartung is young and married. He is partner in a small ranch with his best friend—John Campbell—located just outside the small town of Barkerville, Texas. His life is just coming together after a rough childhood. 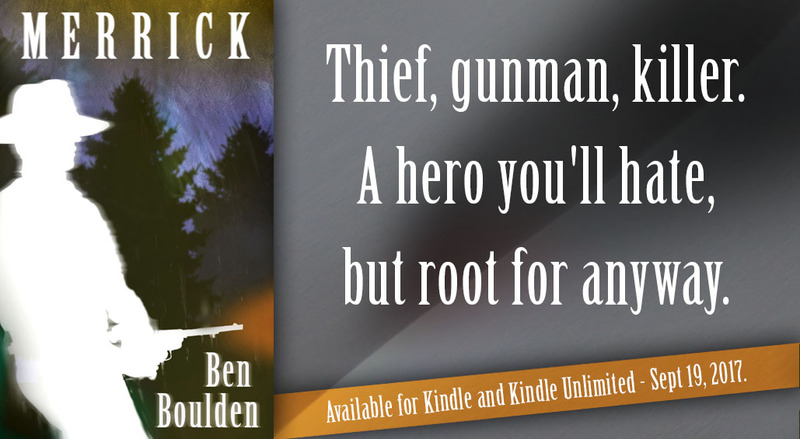 He was an orphan and there is a hint of violence in his past, but that is all behind him until four hired gunmen come to town. It doesn’t take long for the four strangers to make their presence known: they gun down a Barkerville hardman in the hotel, and quickly thereafter dispatch the Marshal. The Barkerville locals are scared and they look to Clay to make a stand against the men, which he does, and does alone. His partner has a game leg and the other townspeople have problems of their own. It’s too dangerous and they have families to think of after all. However, Clay is surprised by what he finds in the gang—something personal and unexpected, and the revelation changes everything. The Useless Gun is the expected: competent action scenes, a tight and linear plot that is more familiar than unfamiliar, and crisp and plentiful dialogue. What elevates it above the ordinary is a narrow vain of emotion Mr Bickham expertly mines throughout the narrative. There is a particularly powerful lynching scene that has a drastic and deep impact on both the protagonist and reader alike. There is also the tragic sense of duty and betrayal that haunts Clay throughout. The Useless Gun is a terrific example of the old ACE Western line—it is short, to the point, and very exciting. It has the feel of an episode of an old television series, less the bad color and strangely cool backdrops. The major plot twist is given away on the packaging—“My Brother, The Outlaw!”—although it really doesn’t diminish the entertainment value of the story. Mr Bickham’s work is a treasure chest of terrific fiction and this novel is a perfect example. A NOTE. Jack M. Bickham wrote in multiple genres: suspense, mystery, Western, thrillers and science fiction. His work was translated into two films: The Apple Dumpling Gang, and Baker's Hawk. 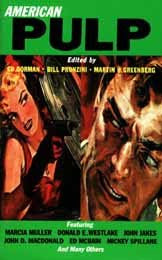 ACE published six of his early novels, including five Westerns--Gunman's Gamble (D-358; 1958), Feud Fury (D-384; 1959), Killer's Paradise (D-442; 1960), The Useless Gun (D-462; 1960), and Hangman's Territory (D-510; 1961)--and one mystery: Dally with a Deadly Doll (D-489; 1961) as by John Miles. Warren Murphy is a master of the quick, witty, and action-filled novel. He co-created the bestselling The Destroyer series, and in the 1980s and 90s wrote several bigger novels including his 1992 novel, Honor Among Thieves. Lieutenant Rostov is a Moscow narcotics cop; the Communist government has barely settled into dust when organized crime begins to make a play for the drug market. The problem, no one believes there is a mafia working the system—no one except Rostov and his team. Rostov requests help from the American government. He needs someone with American mafia experience to consult and, more importantly, prove that organized crime is expanding into the former Soviet Union. What he gets is a former mafia wise guy turned state’s witness named Kamen who is more than a little antsy to get back in the game. 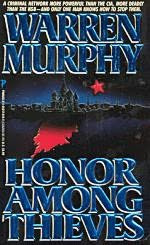 Honor Among Thieves is a 1990s thriller from beginning to end. It involves three of my favorite subjects—in novel form of course—the Soviet Union, drugs (specifically cocaine) and the mafia. The prose is fluid and easy, there is a serious amount of dialogue, and the action is quick and believable. The characters are the expected—from Mr. Murphy at any rate—in that they are well-rounded, in the manner of a thriller, with an abundance of wit, humor and, at times, over-the-top interpersonal relationships. There are several interconnecting story lines that tie together rather nicely and more than enough intrigue to keep the pages interesting. The most unique aspect of the novel—at least looking back with 20-20 vision—is that the Russian mafia was still in shadow and needed to be fully revealed and proven. A naive thought (the culture, rather than the author) with the impressive growth that the Russian crime syndicates have made since the fall of Soviet communism, both domestically and internationally. Honor Among Thieves is an entertaining blast from the past. It is a fun read that reminded me of my comfortable and warm youth. It has lost a few steps since it was published, but it is very much worth keeping an eye open for in your favorite used bookshop or thrift store. But, heck, all of Murphy's novels are worth a look. I really enjoy the old television series The Twilight Zone, and to a lesser extent the two television series that it spawned. It has been so long since I saw the movie version that I can't really remember it. I was probably ten or eleven when I saw it. Here are a few different intros for the original and the 1980s series--I couldn't find the series that aired on UPN in 2002--and the trailer for the film. I trusted the people who uploaded the intros as far as the season it went with, but as I viewed them, each did feel right for the season it posted. The original The Twilight Zone pilot intro--notice it is absent Rod Serling as narrator. The intro for season 3, I think. This is a re-done intro for the later seasons of The Twilight Zone, but it is faithful to the original, except the graphics are sharper. George Gates was a travel writer, but since his young son was murdered he no longer has a taste for the road or the stories he once wrote. Now he works for the local newspaper and writes human-interest stories about local events and personalities. His life changes when George meets a retired cop at his local pub that worked an unsolved disappearance of a young poet in 1987. 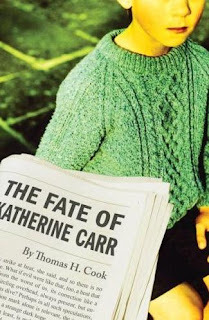 The young woman—Katherine Carr—disappeared without a trace, but she left behind a story about a woman being stalked, a story with a main character who shared her name, and very possibly her fate. The story powerfully resonates with George, and for the first time in years he is interested in something beyond booze and memories. He also meets a young girl with the premature aging disease progeria who seems to have an insight into Katherine’s disappearance as well as an understanding of George and his dead son. The characters are rich and fully developed, but the story tends to meander from its forward momentum and balances precariously on atmosphere and dread—the dread of loneliness, failure and betrayal. This plodding works well for much of the novel, but in the end it feels too heavy and opaque to be completely successful. I've been getting back into the work of Brian Garfield over the past few weeks and I'm amazed at how broad his body of work is; amazed and happy, because it means I have bunches of great reading ahead. 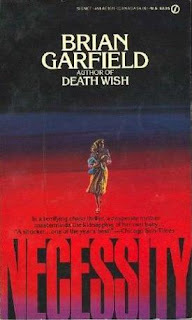 Garfield is best known for his suspense novels and Westerns, particularly his later Westerns--those written in the 1970s. But he wrote a bunch of Westerns for the ACE Double line in the 1960s. The first was published in 1961, which, if my math is correct, made him 21 or 22 years old when it hit print. He wrote twelve Westerns (at least that is the number of titles I can find) that were published by ACE in the 1960s and 1970s under four different names--Brian Garfield, Brian Wynne Garfield, Brian Wynne, and Frank Wynne. The titles are listed below. Most of the titles were also republished in the 1970s by ACE. 48885 Gunslick Territory as by Brian Wynne w/ Loner with a Gun by John Callahan (1973) It has come to my attention that Brian Garfield didn't write Gunslick Territory, but rather it was written by Dean Own. Apparently it was written after Garfield left ACE and the Jeremy Six series behind him. He sued ACE and won. However, according the Mystery File website, there were at least two printings of the novel. If anyone knows of additional ACE titles written by Mr Garfield, please either shoot me an email, or post it as a comment. Richard Wheeler is an award winning Western writer; he has won an astounding five Spur Awards and the Owen Wister Award for lifetime achievement. His work ranges from the traditional—although with a style and grace all is his own—to large and impressive historical novels. 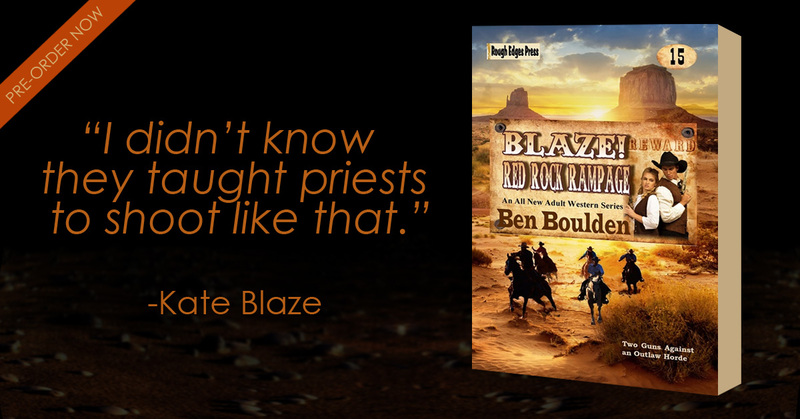 His recent output has mainly been in his widely celebrated Barnaby Skye series: a series that features a sturdy and accurate portrayal of the early European exploration of the American West. Mr Wheeler is a writer that any reader of the American West should read, and a writer whose work, especially over the past several years, has been pigeonholed—as has much of the Western genre—into an old fashioned ideal of what makes a Western: bad guys with guns and loner heroes ranging across the badlands. A type of story that has appeal to many—myself included—but unfortunately puts off many would-be readers. And Mr Wheeler’s work would do well along side of such writers as Larry McMurtry, A.B. Guthrie, Win Blevins, and others who have escaped the tag of genre fiction. His latest novel, Bad Apple, is an example of a different kind of Western—it is a modern story in the high country of Montana. It is a private eye story with all of the trappings: murder, suspicion, a beautiful and willing secretary, cheating wives, suspects who have something to hide, and a client whose actions are more than strange. Cletus Parr is a Livestock Broker and occasional private detective. He specializes in livestock protection and made a splash a few years earlier when he broke-up a large and successful rustling operation. He is a bit of a dandy. He wears creased jeans and gaudy pearly-buttoned shirts: “he pulled on his best $62 Larry Mahan western shirt, cream colored with cerise roses and curly black stems rioting all over it.” He is the type of guy most of us try to avoid—a little obnoxious and a user—but he is also pretty good at what he does and worth a laugh from time-to-time. The novel opens with Cletus wakened by the ringing telephone. It is his answering service. 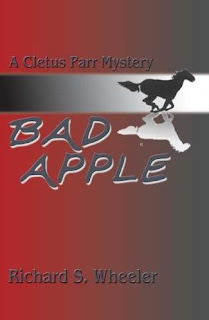 Bad Apple, maybe the best cutting horse ever, has been gunned down in his pen out at Rex Patee’s ranch. Patee wants Cletus out to investigate immediately, and Parr is more than willing because he foresees a sizable fee in his future. The list of suspects is long—Bad Apple has dominated the cutting horse world for years and there are more than a few owners and trainers who would love to see the last of him. Cletus immediately suspects Patee, but he goes ahead and develops an overly complicated plan to finger the shooter. Cletus is all show and he promises more than he can deliver, but it sure impresses his client that he seemingly has all the angles covered. He then starts seeking out the local suspects, and there are more than a few, in a slick and fast-talker sorta way. He doesn’t get very far and as the novel progresses his suspect list shortens, but so does the patience of his client. Bad Apple is a surprising story. It is pure mystery—a whodunit with enough charisma and American-style action to keep it fresh and exciting—with a logical conclusion and an interesting and original angle. It showcases a world, that of world-class cutting horses, that I knew nothing about in an accessible and extremely interesting and entertaining manner. The protagonist is an interesting and good-natured parody of the hardboiled detective. He is more bravado than substance, but Mr Wheeler develops him in such a manner that what he lacks in skill, he makes up for in persistence and humor. His secretary is a light and whining version of Mike Hammer’s Velda, and he has a relationship with a cop that is reminiscent of Rockford’s relationship with Sergeant Becker: rocky, but in the end pleasant. The mystery is handled well and the murderer isn’t revealed until the final scene. There are enough false leads and suspicion to keep the reader off balance and anxious about flipping the pages. Bad Apple is a change-up from Wheeler’s usual production, but it is definitely worth a look. I went over to YouTube hoping to find a trailer for the film version of Brian Garfield's Hopscotch. Unfortunately I came up empty, but I did find trailers for a few other Garfield adaptations. The most widely known is Death Wish, a film that spawned four sequels and epitomizes the 1980s vigilante film. Although it--the original or any of its sequels--didn't capture the essence or greatness of the novel. In fact, I've read that Mr Garfield didn't like the film much, but it is probably the project he is best known for. And I have to admit I like Charles Bronson. Alas. Here they are...it should also be noted that Death Wish is being remade by Sylvester Stallone with an expected release date of 2010. —which is all terrific, but Mr Garfield also flavors the story with technical information about creating n ew identities and, more importantly, erasing an original identity. He creates a world that is real and absorbing without slowing the story with too much detail and information. There is a terrific little bookstore in the closest major metropolis--I live in a town of about 27,000 people, and love it!--that has a pretty decent selection of old paperbacks, including a bunch of ACE Double mysteries. Anyway, it's gotten me excited about the old ACE line, particularly the mysteries. So in my enthusiasm here are the cover scans of the Robert Bloch novels--two novels and one short story collection actually--published by ACE. It's worth noting that many are of the opinion that the ACE crime line is inferior to many of its contemporaries, which is probably true, but if Robert Bloch's name is on the book; buy it! 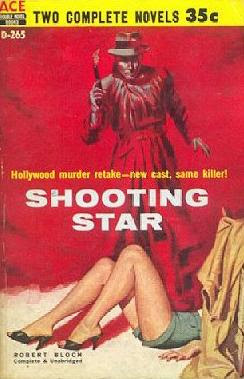 Shooting Star was published in 1958. 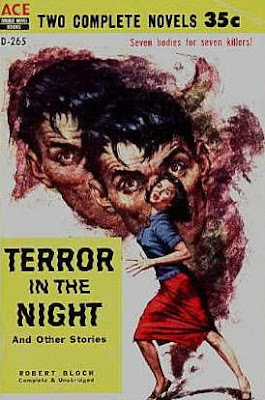 Terror in the Night was the second book published with Shooting Star in 1958. 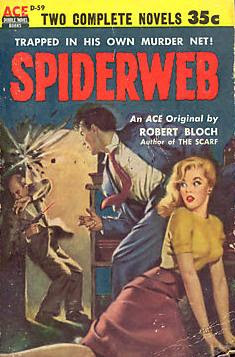 Robert Bloch is best known as a horror writer, but in his early career he wrote some terrific crime novels, including the titles above. His work is tight, thrilling, vivid, and very fun. Hard Case Crime republished Spiderweb and Shooting Star in a double format a few years ago--pick it up, it's very much worth the $7.99. Now if HCC would republish Terror in the Night with, say, a collection of David Goodis short stories; or maybe John D. shorts.